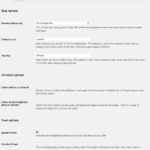 Knowledgebase v1.5.0 is now available int he WordPress.org repository. 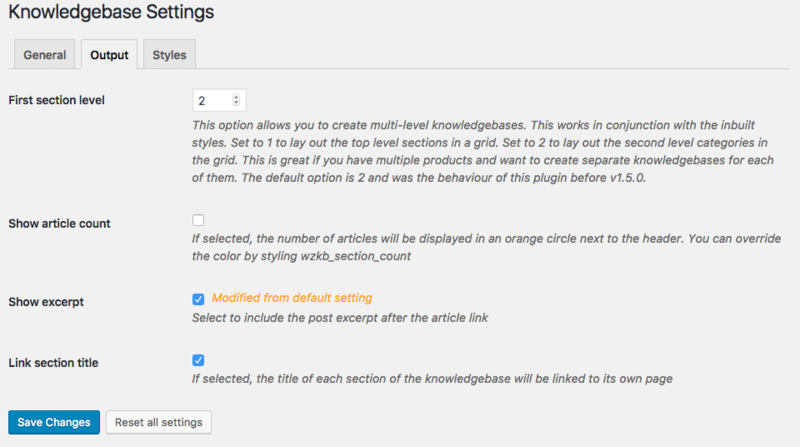 This release brings several new features to better customise your knowledge base. In addition to that, there are few minor changes under the hood to make the plugin easier to use. And, of course, who doesn’t like bug fixes? 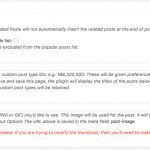 As always, you can update your plugin from within your WordPress Dashboard. If you have any questions, create a new post in the support forum. If you’re an existing user, do consider writing a good review. You can find this setting under the Styles tab. You can now set between 1 and 5 columns to display the various sections of the knowledgebase. Powered by Responsive Grid System, the layout is fully responsive and scales well on different sized displays as well as tablets and mobiles. This setting is a bit more complicated but adds an amazing level of flexibility to your knowledgebase. You can find this labelled as “First section level” under the new Output tab in your Settings page. 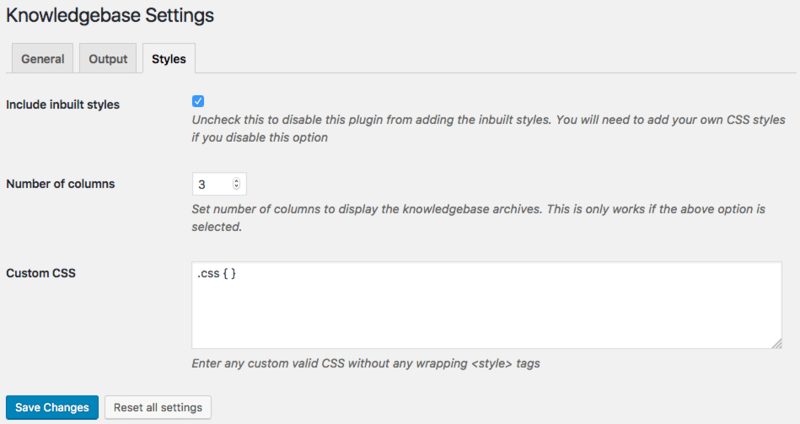 With this setting you can tell the plugin if you’re using the knowledgebase for single or multiple products. e.g. the plugin powers the knowledgebase on this site for my multiple plugins. Section Level 1 is used to store the name of the product. Section Level 2 is the first level categories that hold the independent articles. If you’re using the knowledgebase for a single product, you can set this to 1. 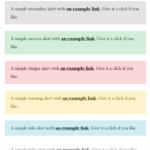 A great update, I have tried it on my local development site and it adds lots of the things that I wanted. It is a good update from the previous version. Thank you for this. You’re welcome. I’ve got several more features that I keep recording into the Github issues page. Hoping to make this a well used plugin that works for all users.